Our precious mother, grandmother, and great-grandmother, Margaret Ann Chute, passed into glory on Tuesday, February 12th, 2019 at the age of 93 years and 11 months. Margaret was born on March 6th, 1925 at Kelfield, SK, the only daughter of Howard and Jean (Kincaid) Kelly. She grew up on the farm in the Kelfield/Dodsland area with her four brothers, completed her schooling in Dodsland, and then attended Briercrest Bible School. While at Briercrest she met Allan Chute, whom she married on October 22nd, 1949. Margaret and Allan lived and farmed in the Tuxford area for many years and later retired into Moose Jaw. They enjoyed travelling to many parts of the world and also spent winter months in Mesa, AZ. 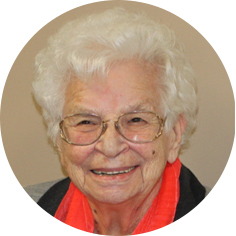 Throughout her life Margaret was a member of and actively involved in the Moose Jaw Alliance Church as well as her involvement in the Christian Women’s Club. She was a very artistic lady and created many paintings and ceramic pieces, as well as treasured porcelain dolls. Her sewing skills created clothing not only for herself and her family but also for her porcelain dolls. Margaret was a very hospitable lady and her door was always open to one and all. She was predeceased by her parents; husband, Allan (2010); grandsons, Reid Chute (1985) and Ryan Chute (2009); and brothers: Gordon, Lorne and Jim Kelly. Margaret is survived by her children: Darla Thiessen (Terry) of Hague, SK, Diane Tiessen (Daryl) of Wilcox, SK, Bartt Chute (Marla) and Carson Chute (Carol) of Moose Jaw, SK; grandchildren: Drew Thiessen (Tammy) of Oakville, ON, Brett Thiessen (Jenna) of Saskatoon, SK, Kendra Tiessen of Regina, SK, Kyle Tiessen of Wilcox, SK, Andrea Garland (Rob) of Moose Jaw, SK, Alana Hazelton (Mike) of Calgary, AB, Evan Chute (Stephanie) of Moose Jaw, SK, Erin Zilkie (Jayson) of Kelowna, BC, and Carter Chute (Megan) of Moose Jaw, SK; great-grandchildren: Luke and Levi Thiessen, Roddy, Prestley and Holton Thiessen, Aubrey and Brant Garland, Rhett and Rogan Chute, Reid Hazelton, Kamdyn , Hadley and Carys Chute, and Micah and Amara Zilkie; brother Frank Kelly (Fran) of Regina, SK; sister-in-law, Joyce Kelly of Kindersley, SK; as well as many nieces and nephews in the Chute and Kelly families. The family would like to extend a very special thank you to Dr. Volker Rininsland for his kindness and caring throughout the years, and also to the caregivers at West Park Crossing and Providence Place in recent months. A Memorial Service will be held on Thursday, February 28th, 2019 at 2:00 p.m. in Moose Jaw Funeral Home. Reverend Wayne Boldt will officiate and interment will take place in Rosedale Cemetery. As an expression of sympathy, donations in Margaret’s name may be made to Briercrest College and Seminary, 510 College Dr, Caronport, SK S0H 0S0. Arrangements are entrusted to Moose Jaw Funeral Home, 268 Mulberry Lane. Todd Sjoberg, Funeral Director 306-693-4550. It is with heavy heart that I send this message of sympathy to the family of Marg Chute. She was a beautiful soul both inside and out,and it was a privilege to call her my friend. She and Al were the first people I met when I first attended the Alliance Church,and we remained friends for all these years. We would meet at the Mulberry for lunch and have a wonderful visit! I will miss her greatly. I’m unable to attend her service as we are still away. Please accept my deepest sympathy for your loss,but we all know we will see her again. To the Chute Families….our sincere condolences on Marg’s passing. You are in our thoughts and prayers during this difficult time. Marg was always interested in what you were doing and how things were going for you. Will miss visiting with her. As things stand at the moment I have another appointment so will not be able to attend her funeral but will be thinking of all of you. So sad to hear of Marg’s passing.I had known her for many years.A lovely lady and a great Avon customer.Your time to rest now. So many memories flood our minds when we think of Marg Chute. Our whole family will remember her for her unique care and concern for ALL of us and our well being. She truly was a friend. We are thinking of all of you children and grandchildren at this time and know that your memories will hold you through difficult days. We rejoice with you in the fact that she is with Jesus. God bless you all for your faithfulness in caring for her. Thank you for reaching out to let us know of Margaret’s passing. She was a lovely and caring lady. Although we will not be able to attend the funeral please know our thoughts and prayers are with you at this time. Once again, thank you so much for letting us know about your mother. I passed the sad news on to our cousin, Sharee Clarke, (Greta’s daughter). Since Sharee doesn’t have access to a computer, she asked me to send her sympathies on to you and the rest of your mother’s family. She will pass the news on to her siblings (Rae, Darlene & Ross). We can’t help but rejoice knowing Marg is with her Lord and Saviour. She was such a great Lady, a dear friend and great example for me. Our thoughts and prayers are with all her dear family, she loved you all so much!! We are so sorry we won’t be at her funeral, you will be in our thoughts and prayers. Very sorry to hear of Mrs. Chute’s passing. She was a kind and gentle person and Kathy and I enjoyed her as a neighbor on Elisia Drive. Deepest sympathies go out to the Chute families at this sad time. She of course left her kind legacy in all of her children of whom I had the pleasure of growing up with. Our thoughts and prayers are with each of you at this time. Auntie Margaret was a very special lady with such a kind and generous heart. She always welcomed you into her home and made you feel like one of the family. She was always interested in what you were doing and ready to give a helping hand. She loved her family so very much. She will be missed, but we rejoice with you knowing that she is with her Lord and Saviour. We are so sorry we could not attend the funeral. Our deepest sympathy to each of you. May you find comfort in the arms of the Lord at this time. We have just heard of Margaret’s passing and are so sad for the loss that you feel as her family, but also rejoice with you that she is “home” in eternity with her Saviour. We have such great memories of fun times together with your family in our growing up years. Margaret was such a gracious host and great cook, she loved to laugh and was such fun to be around. We always enjoyed our visits with her in person or on the phone. We felt loved by her. She will truly be missed. Hugs to all of the family. We are so sorry to hear Mrs.Margaret Chute has died. My wife and I like to share our sympathy to the family. Also we would like to share these comforting from Bible to comfort all in the family. 1Corinthians 15: 22 – 26. We were saddened to just hear of your mom’s homegoing. She was an example of caring and encouragement to us over the years. Our condolences to you and your families. She has left a wonderful legacy for you all.